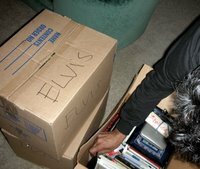 Who moves across the country with an ENTIRE BOX of Elvis stuff? Hint #1: The same person who has a Michael Jackson night light. Though in no way am I opposed to entire boxes of Elvis stuff and Michael Jackson night lights.